TeamBath Netball Club (TBNC) was formed ten years ago from the merger of TeamBath Tigers and TeamBath Toucans netball clubs. TeamBath Tigers Netball Club (formerly Bath Netball Club) have played competitive netball in the Bath area for over 40 years, adding junior netball 20 years ago. 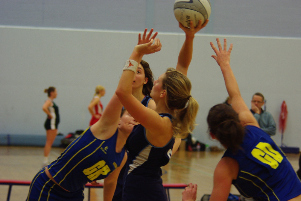 TeamBath Toucans Netball Club was set up several years ago taking its membership primarily from the student population at Bath University. Both clubs have achieved phenomenal success in the National Premier league, SW Regional and Avon leagues. With changes being brought about by England Netball it was considered the right time to combine the clubs and bring together the best that both clubs had to offer, whilst offering members greater opportunities to play at a higher level. As a result the club, in partnership with Bath University's TRIBE programme, can now offer netball development and competition at all levels of participation from Hi-five netball at U11 to competitive netball at National Premier League level. Opportunities and sponsorship for coaching and umpiring qualification are also available. For 2017/2018 TBNC will support eight senior teams from National Premier League to Avon League Division 8, and ten junior competitive teams at U16, U14 and U12. For further information please see the other links.